NEW YORK-The streets outside of the Madison Avenue headquarters of the Metropolitan Transportation Authority were filled by more than 5,000 angry transit workers out to challenge both the MTA and Mayor Michael Bloomberg, September 29. 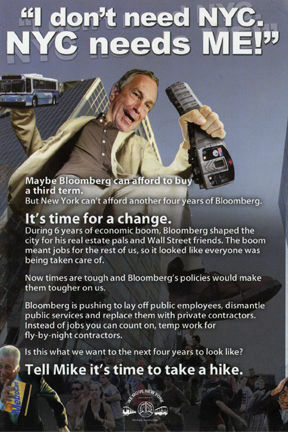 Bloomberg, after a binding arbitration process between transit workers and the MTA, is actively working to undermine the contract agreed to. The workers are members of Transport Workers Union Local 100. 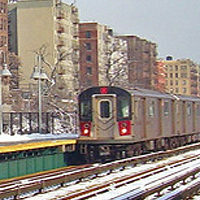 Some 34,000 of Local 100’s 38,000 members are employed by the MTA, either by New York City Transit, the Manhattan and Bronx Surface Operating Authority or by MTA bus. Also present were the leaders of two Amalgamated Transit Union locals that represent a few thousand NYCT workers, Angelo Tanzi president of ATU local 726, representing workers at two Staten Island bus depots, and I. Daneek Miller, president of ATU Local1056, representing workers at three Queens bus depots. The workers had been awarded a three-year pact through a legally binding arbitration process. Because the award was, in the MTA’s estimation, favorable to the workers, the MTA took the unusual step of attempting to block the award via legal maneuvering, claiming that it doesn’t have the funds to pay the awarded raises. But in doing so, the Authority is spending thousands of dollars per hour in fees to high priced. Anita Clinton, one of the transit system’s first female railcar mechanics, read a letter, sent in 2005 by the MTA’s then chief negotiator, Dellaverson, to the local 100 president. In the letter Dellaverson advocated binding arbitration as a solution to that year’s contract impasse. The irony of this – that now, when it was not to their liking, the MTA was denouncing an arbitration award – was not lost on the assembled workers. For their part, the transit workers won’t be content to sit on their hands and wait for the MTA to give them their contract. Instead, they are promising to “give the MTA a taste of Hell on a Day of Outrage” scheduled for October 14th. That is, if the MTA hasn’t decided to abandon its anti worker assault by then. Other labor leaders expressing solidarity and the same sentiment included Stuart Applebaum of RWDSU, Mike Mulgrew of the United Federation of Teachers, Greg Floyd Teamsters Local 237, Norman Seabrook of the Correction Officers Benevolent Association, Barbara Bowen of Professional Staff Congress, Dean Devita of the National Conference of Oilers and Fireman 32BJ, Norman Brown of the IAM, (who, as a non-voting member, represents the coalition of Metro-North Railroad unions on the MTA board) and Lillian Roberts, executive director of New York’s powerful AFSCME District Council 37. Gary Bono is an activist and retired transit worker writing from New York.